South Italy and the Island of Sardinia. 1 : 1500000 Johnston, W. & A.K. 1 : 2090000 Levasseur, E.
1 : 6000000 Fenner, Rest. 1 : 1700000 Korsika (Francie) Rizzi Zannoni, Giovanni Antonio Homannianis Hered. 1 : 2800000 Vivien de St Martin, L.
1 : 3168000 Tallis, J. 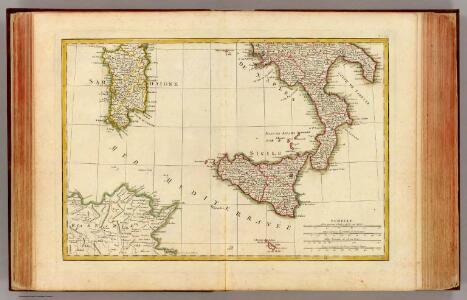 & F.
Southern Italy: Kingdom Of Naples, I. Sardinia & Malta. 1 : 1900800 Colton, G.W. 1 : 2000000 Colton, G.W. 1 : 1500000 Vivien St Martin, L.